Coffee Syrup & other delicious hand-crafted treats. Announcement ** ANNOUNCING NEW PRODUCT: SALTED COFFEE CARAMEL POPCORN ** -Sweet & salty perfection, made with Coffee Syrup for a unique and delicious flavor. Try some! For LOCAL orders via Etsy, you can contact me to arrange pickup/delivery, then I will CREDIT SHIPPING CHARGES! ** ANNOUNCING NEW PRODUCT: SALTED COFFEE CARAMEL POPCORN ** -Sweet & salty perfection, made with Coffee Syrup for a unique and delicious flavor. Try some! Great packaging and fast shipping. I love the coffee syrup. Many thanks! 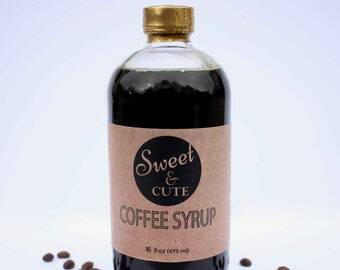 I LOVE this coffee syrup! I tried it at a local wine festival and bought a bottle to bring home. Now I use it to make coffee milk every morning. Tina also refunded my shipping cost by delivering my order directly. Thank you!!! I grew up in RI. coffee milk was my favorite. Can’t find it in Florida. I decided to order homemade instead of the commercial syrup I grew up on. I’m so glad I did. Delicious! 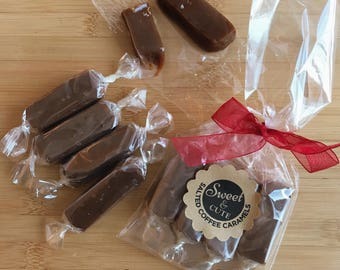 I ordered coffee candy too. What a special treat. I’ll definitely be ordering more of both. They came on time and packed well. Thanks for bringing back my childhood. It’s been a long time. We use eco-friendly packaging and shipping! The best way to enjoy Coffee Syrup - over ice cream! Sweet & Cute Coffee Syrup over ice cream - always a hit at samplings! Made with two simple ingredients: locally roasted coffee and organic cane sugar. Try it over ice cream for a Sweet Affogato. Delicious in so many ways and great for both sweet and savory recipes! Making the world a little sweeter. I've always loved to bake - to then see the smile on everyone's face when enjoying a sweet treat. I'm also a coffee junky. In doing craft shows with my girlfriends, I started experimenting with different goodies (syrups, marshmallows, caramels, etc). They all were loved, but with my Coffee Syrup, a star was born!! Everyone who tasted it, loved it and thought it very unique. I am so excited to be launching my first official product and starting my business. I did it not only to follow my dream, but also to inspire my 11 yr old daughter to always take chances on what you love and don't settle! I love to make others smile and found that sweets most often do the trick! As a coffee lover, I brought my two favorite things together to make Coffee Syrup. Our family lives in Honeoye Falls, NY and my daughter inspired the name of my company! Production partner is a co-packer with a commercial food production facility and all appropriate permits to produce food. Yes, Coffee Syrup is available wholesale. Please contact me directly. Yes, though not a lot - approximately 10mg per tablespoon. The syrup is made with dark roast coffee. What can I use the syrup for? The possibilities are endless, but to start with - it is delicious over ice cream, stirred into milk to make "Coffee Milk" (official drink of Rhode Island), in cocktails, and generally used in recipes where you might use sugar, brown sugar, maple syrup or similar simple syrup. Recipes will be added to Facebook regularly. What is the shelf life of the Coffee Syrup? The Coffee Syrup has a very long shelf life! We give it a 2 year “sell by”. It lasts quite a while after opening also and can be kept fresh even longer if refrigerated. Months if not longer. (Per Cornell).